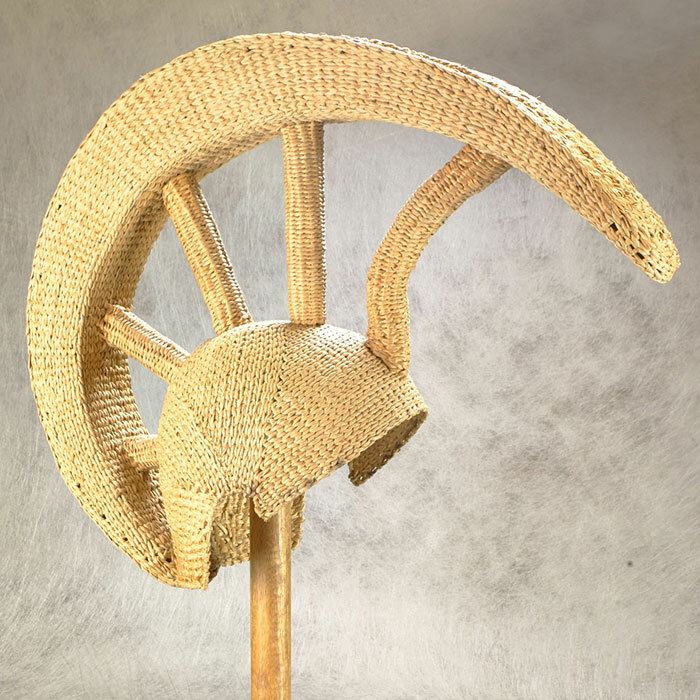 Worn by the aliʻi chief in battle and ceremony, its design shows the rank of the person wearing it. 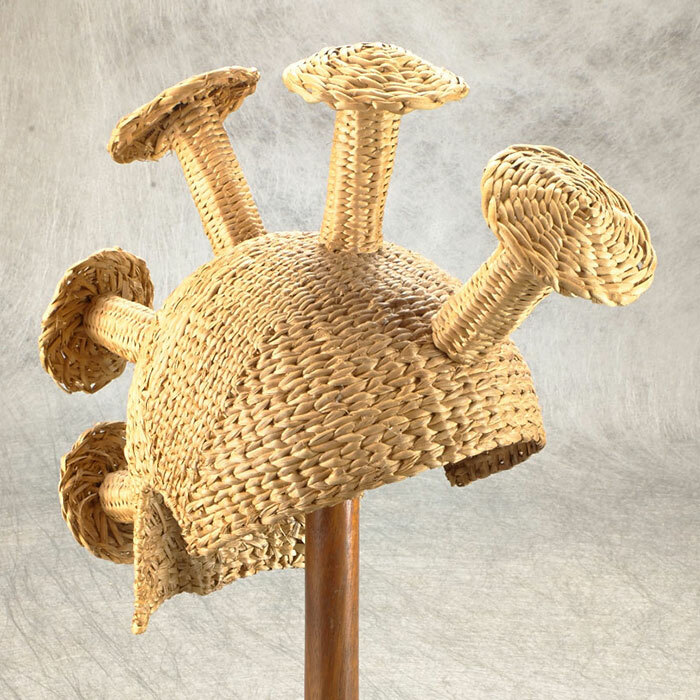 MAHIOLE - Mushroom Helmet	Worn by the lower chiefs and warriors, its design shows the rank of the person wearing it. 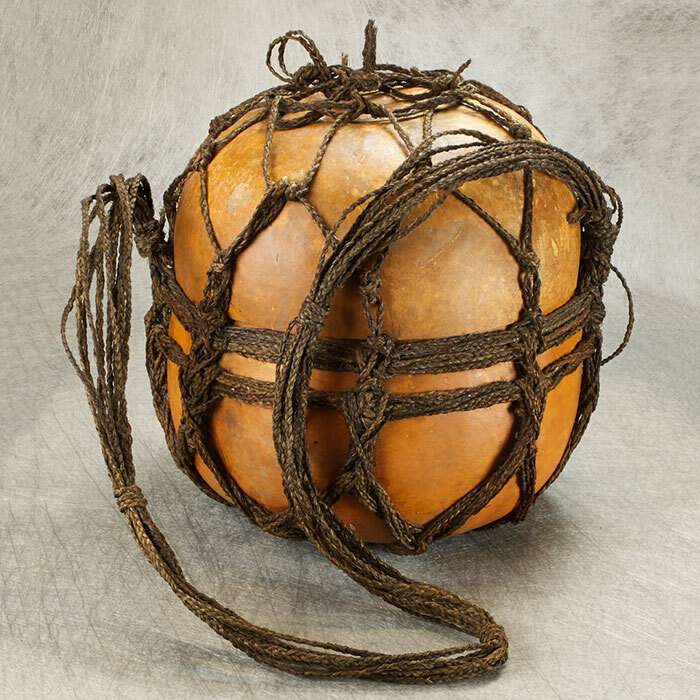 HĪNAʻI POEPOE - Large Covered Basket ‘Ie‘ie dyed with kukui bark is twined around gourds to protect and decorate them. 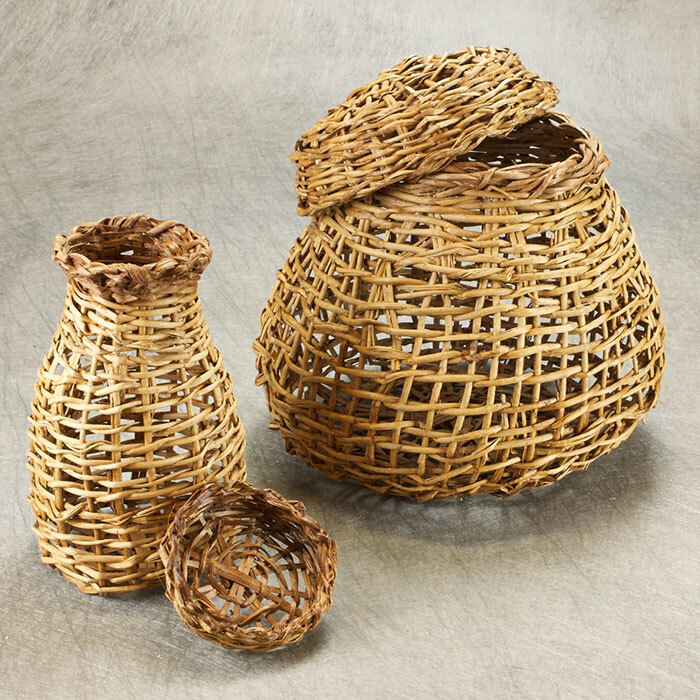 HĪNAʻI HOʻOMOE IʻA - Coarse baskets Coarse baskets twined out of ‘ie‘ie are used to store dried fish, a staple of the Polynesian diet. HĪNAʻI - Circular Fish Traps Made of ‘ie ‘ie, fish swim into the circular trap through the hole in the top to feed on bait and are trapped inside. 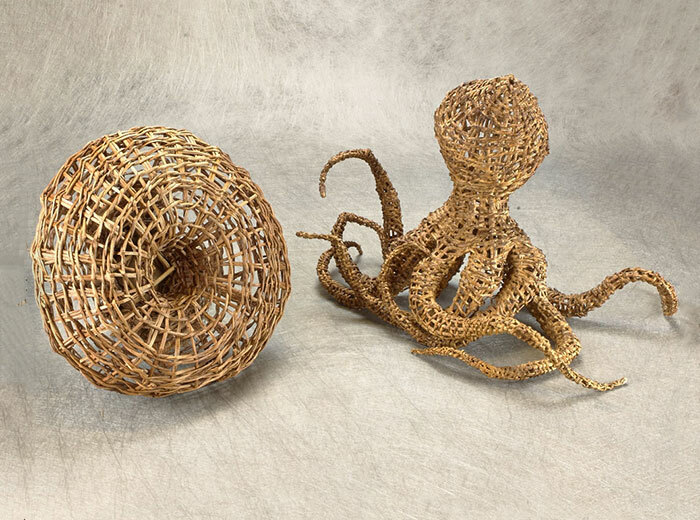 HĪNAʻI - Circular Fish Traps And Contemporary Woven Octopus Both are woven out of ‘ie‘ie and dyed with kukui bark. 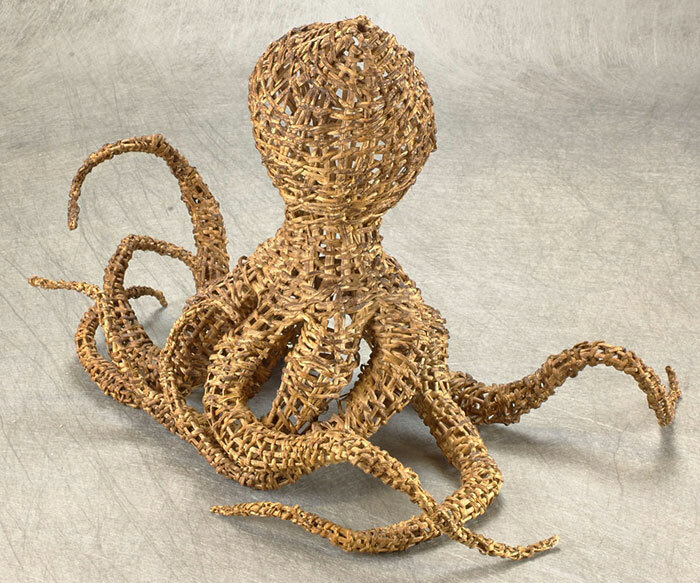 "Wise Man Of The Sea" The octopus sculpture is woven with the same technique as ancient fish traps. 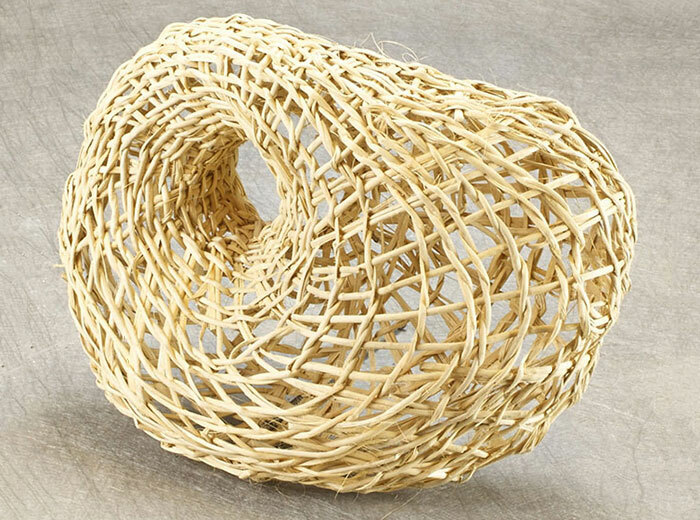 "Flow" Another sculptural piece woven with the same technique as a fish trap. This one is left in its natural color with no dye. 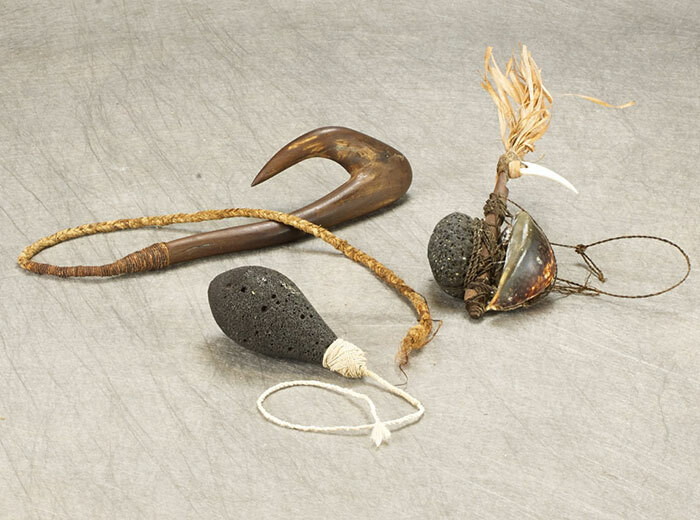 MAKAU MANŌ - Shark Hook, PŌHAKU LOA - Large Plumet Sinker, LŪHE’E - Octopus Lure A large heavy wooden hook made from the root of the native ironwood tree, a specialized deep water fishing hook, and an octopus lure made from a cowry shell. 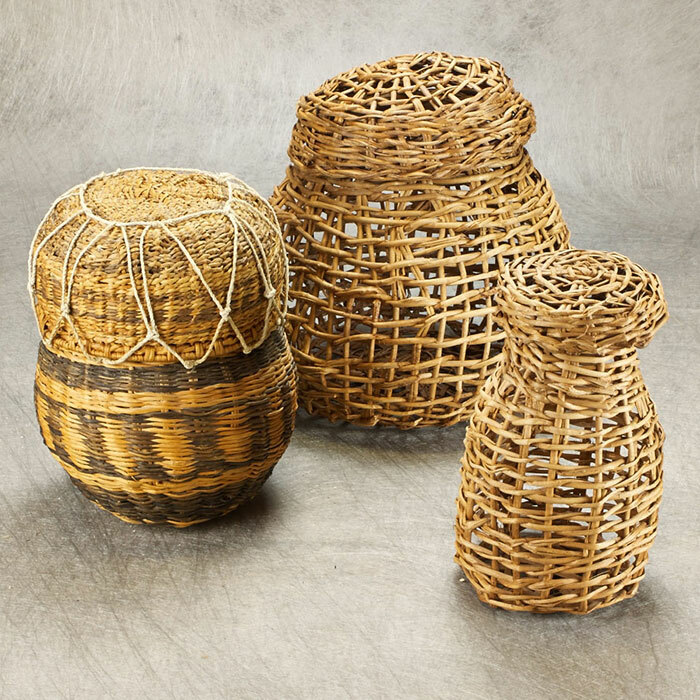 IPU - Storage Goruds Larger gourds with tops were used to store food such as poi and dried fish. The tops would keep them clean and dry. 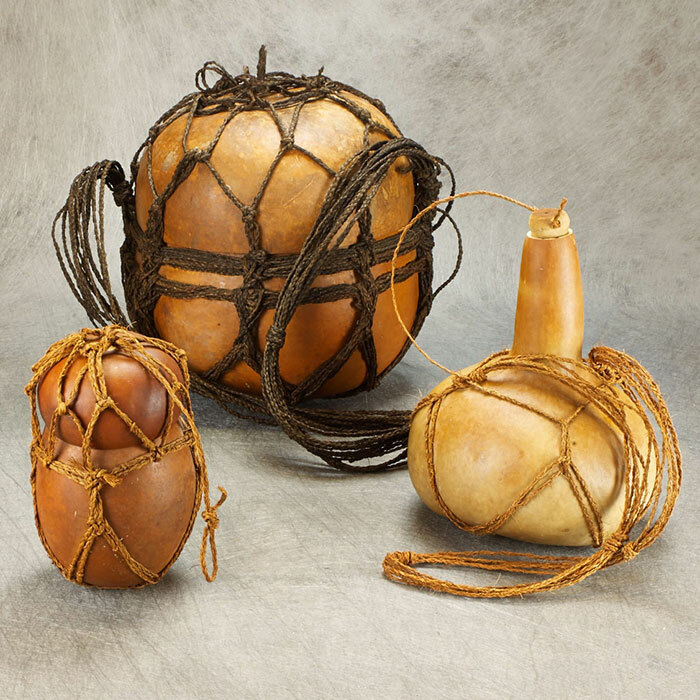 NĀ IPU - Gourds Larger gourds were used with covers (po’i) and had suspensory loops or bails (hāāwele) to hold them together and for carrying. 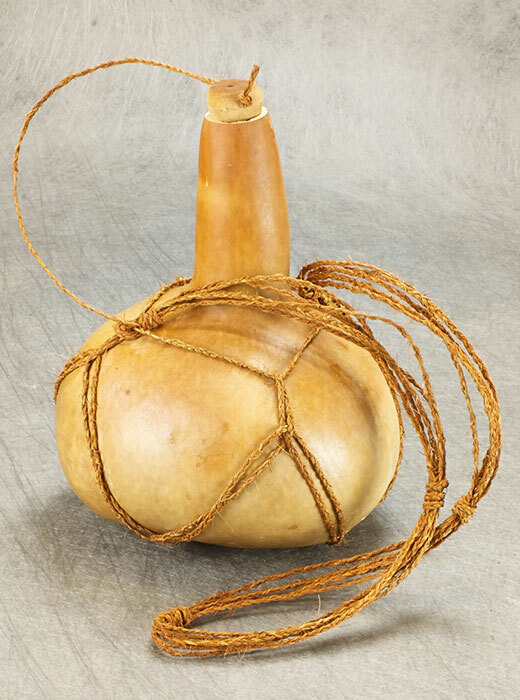 IPU WAI - Water Gourd Gourds were used for storage of materials, food and water. The long necked gourd made carrying and pouring water easy. 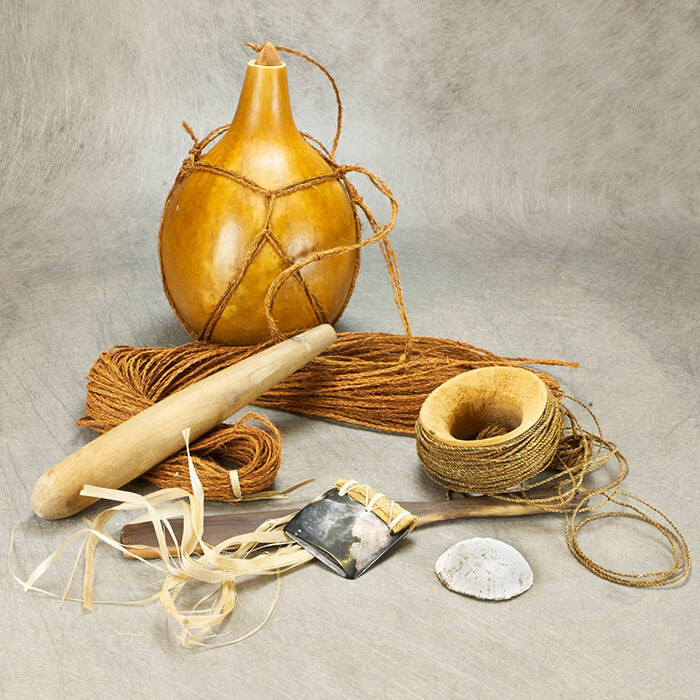 The objects above are museum quality reproductions of traditional Hawai'ian cultural artifacts. 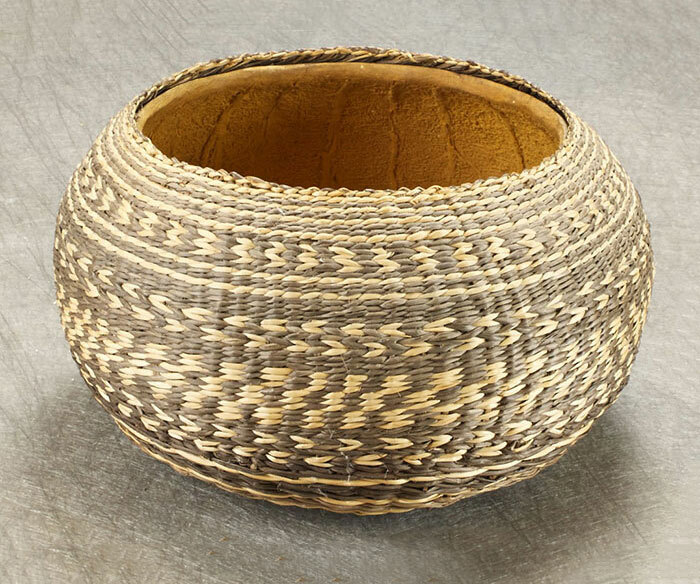 Inspired by the expert craftsmanship, the high level of aesthetics and the natural materials used in the culture of old Hawai‘i, Gary's work is noted for its attention to detail, it's authentic designs and use of traditional materials and processes. 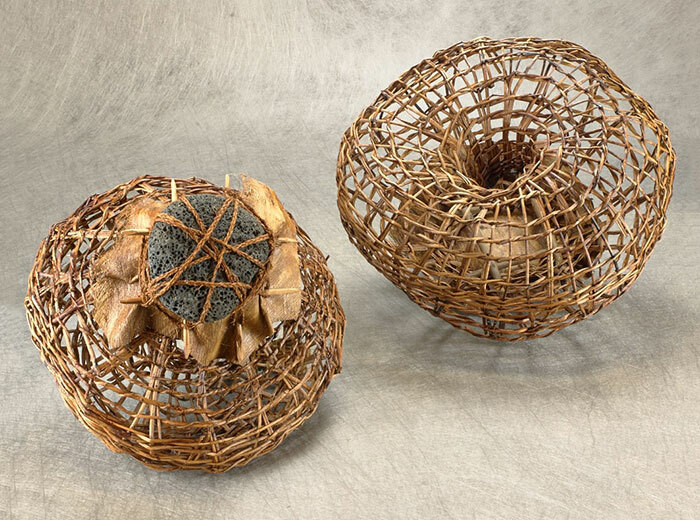 Gary gathers his materials in a manner that respects the forest: always careful to nurture the plants and help them to reproduce more than was taken, in the same spirit as the original craftsmen and practicioners. None of the materials are from modern sources. 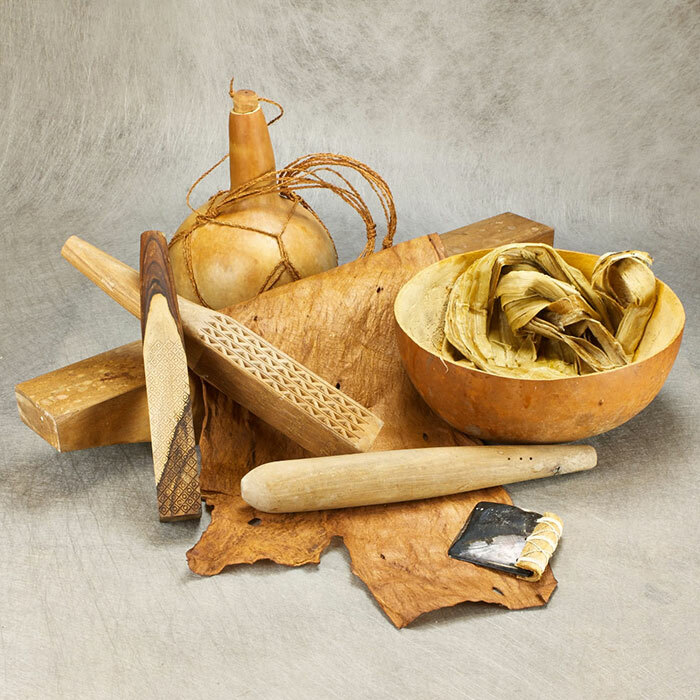 Everything from the raw fiber to the plant based dyes is sustainably harvested from the forest or ocean. Selected cultural artifacts, as well as traditional and contemporary ipu are available from Ipu Kane Gallery in Hawi, on the Big Island. They may also be purchased directly from the artist. Photos of cultural artifacts by Gary Eoff are licensed under a Creative Commons Attribution-NonCommercial-NoDerivs 3.0 Unported License.